500 years ago today, Martin Luther hammered the Catholic Church when he nailed The 95 Theses to the door of the Castle Church in Germany—igniting the Reformation. 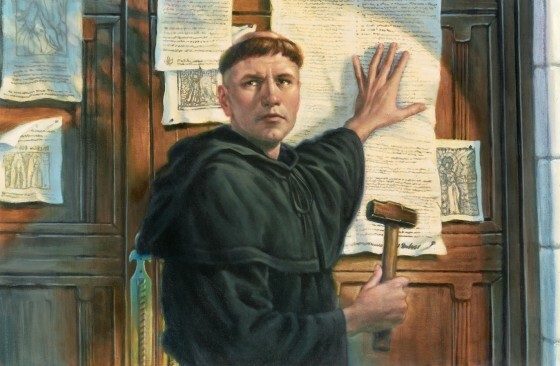 The 95 Theses was Martin Luther’s pastoral reaction to the Catholic Church’s indulgence preachers, who sold certificates promising buyers or their loved ones reduced suffering in purgatory. In other words, they were the prosperity preachers of that time. In The 95 Theses, Martin Luther said, “[the indulgence preachers] preach only human doctrines who say that as soon as the money clinks into the money chest, the soul flies out of purgatory.” Doesn’t that sound familiar? I read The 95 Theses for the first time several years ago when I was beginning to challenge some of the doctrines of my church at that time. Luther’s challenges to the Catholic Church helped me embrace my own opposition to my church selling the gospel. Luther’s courageous words about the Pope gave me courage to disagree with my pastor. Most of all, The 95 Theses helped me grasp that the prosperity gospel is a deviation from the Protestant Reformation. 1. Indulgence preachers promised that financial gifts to their ministries would save people from suffering in death. In the same way, prosperity preachers promise that financial gifts to their ministries will save people from suffering in life. Neither are true. God is not cheap; we cannot buy his favour. We cannot afford it. We are redeemed by the precious blood of Christ, not money. 4. This suffering includes temptation, persecution, and maybe poverty and sickness. Some of the godliest people in the world are either very poor or very sick, or both. 5. Financial gifts to the devil’s favourite preachers cannot remove poverty or sickness from us. Financial gifts to prosperity preachers cannot replace prayer. God might remove poverty and sickness from us through prayer. However, our offerings are meant to bless others, not ourselves. It’s designed to advance the good news, especially through our local church. Our offerings are not investments. 7. They make themselves rich by preying on the poor. Prosperity preachers are everywhere in the world, but they are most popular in Africa, Asia, and South America, where they manipulate poor and sick people into buying wealth and healing with their last coins. They never deliver on their promise, nor can they. The money they receive fund their mansions, private airplanes, and expensive suits. They are not preachers of the gospel, they are religious pyramid schemers. 9. God does not promise to heal us from all our diseases. If God has promised healing for all believers, why do we die? 10. Sometimes God heals us, sometimes he doesn’t. Always, however, his grace is sufficient for us. 2 Corinthians 12:7-10. 11. The prosperity gospel suggests that people are at fault for their diseases. It blames people’s lack of faith for why they are not experiencing healing. 12. Prosperity preachers are today’s version of Job’s friends. They further afflict the afflicted. But their eternal affliction awaits them. 13. Faith should not be confused with self-centered, religious wishes. Faith is defined by our trust in the promises of God, in health or sickness, in wealth or in poverty. 14. Our sufferings in this world conform us into the image of Christ. They remind us that our citizenship and wealth and health is in heaven. They produce our eager anticipation of the second coming of Jesus Christ. 15. Therefore, we should remember the last words of Luther’s 95 Theses: “thus be confident of entering into heaven through many tribulations rather than through the false security of peace.” (Acts 14:22).